The vision is to create a series of unique spaces and experiences based upon each of downtown ClevelandÕs districts. These spaces are organized along a central pedestrian and bike path. 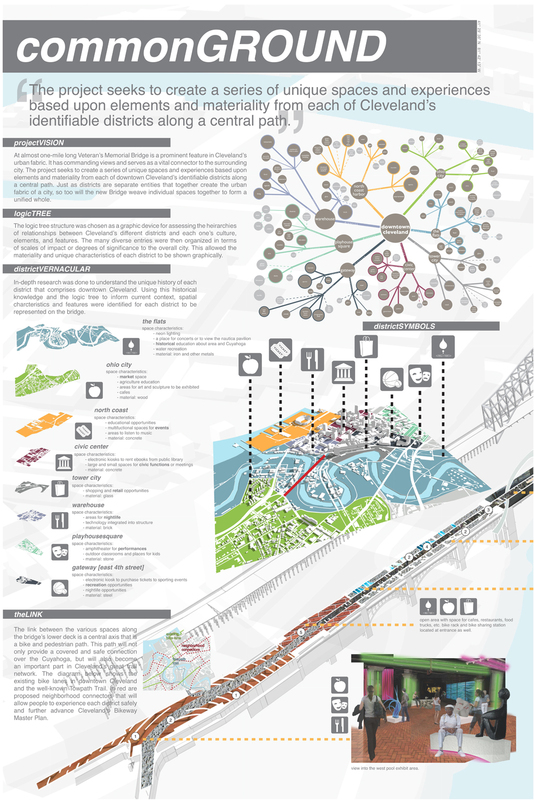 The new Bridge will weave these individual spaces together to form a unified whole, much like individual districts together comprise the urban fabric of a city. The form of the Bridge is based upon abstract shapes from the Cuyahoga River, which features curving lines flowing in and out of the formal, rigid structure. These create visual interest and prevent segregation of areas based upon existing rectilinear forms. The spaces include an art exhibition area, cafŽs, plazas, bike sharing stations, a museum of Cleveland history, multifunctional spaces for events and recreation, amphitheaters, and workout and play areas for adults and kids among others. These spaces are all unified by a path that doubles as a ÒTimeline Trail,Ó contemporary and neon lighting, and smartphone technology to allow users to interact with bridge features and events. 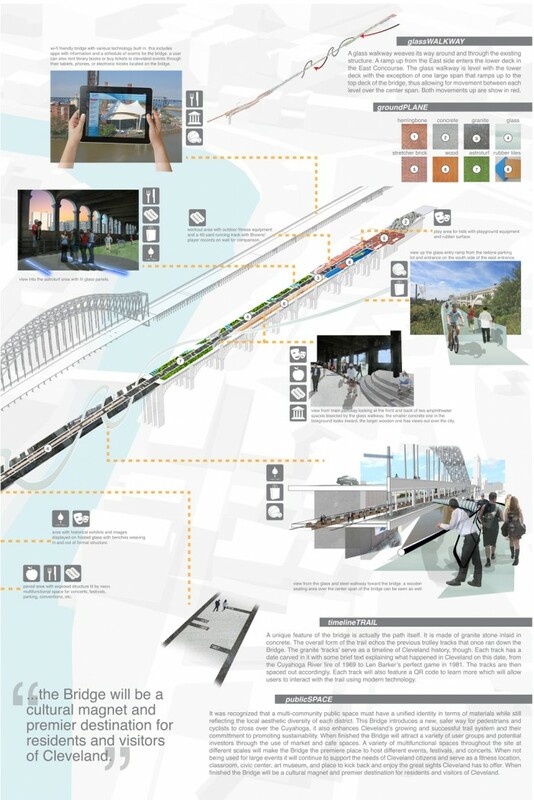 When finished the Bridge will set a standard for technology within a public outdoor space. The siteÕs unique architectural qualities will be preserved and enhanced through the use of materiality, lighting, and paving. 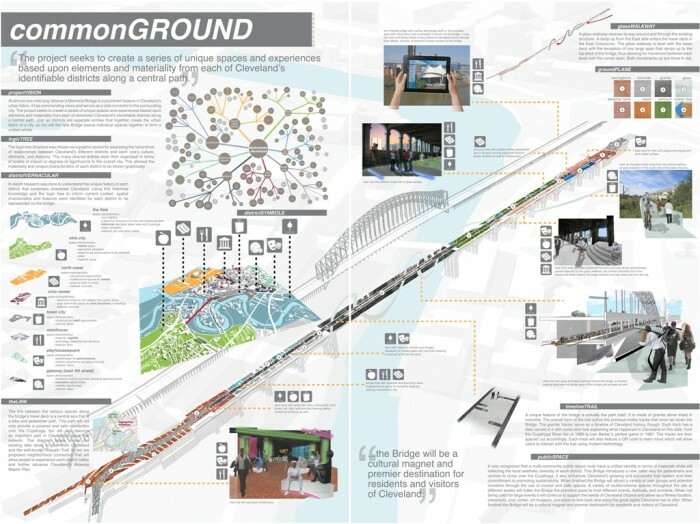 It will provide meaningful connections to existing and proposed Cleveland plans, while serving as a cultural magnet for the citizens and visitors of the city.